Removing categories from Quicken 2012 takes only a couple of keystrokes. You can change a category name, its type, its description, and its tax-related setting if you later discover you made some mistake, such as misspelling a word in a description. Click the category you want to remove and then choose the Delete button that appears. If no transactions are in the category, Quicken displays a message that asks you to confirm your decision. You can’t remove any categories you’re using for some old transaction. Accordingly, you may need to first re-categorize transactions that use a category you want to nuke. If you want to remove the selected category, click OK. Otherwise, press the Esc key or click the Cancel button. Display the Category List window. Use the arrow keys or click with your mouse to select the category you want to change, and then click the Edit button. 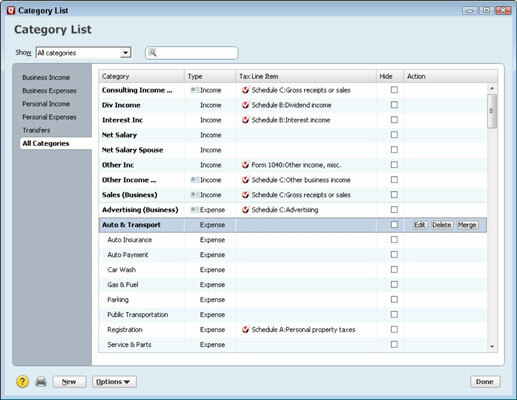 Quicken displays a dialog box that has text boxes and option buttons describing the selected category’s information: its name, description, type, and tax-related settings. Make the changes you want by replacing text box contents or changing option button settings. Click OK to save your changes and return to the Category List window. A quick, related point: If you select a category and then click the Merge button — the button appears to the right of the category information — Quicken displays a Merge Category dialog box, which you use to re-categorize transactions in the selected category. The dialog box provides a drop-down list box you use to select the new category you want to use. The dialog box also provides a check box you can select if you want to delete the category after moving transactions out of it. Note that you may need to maximize the Category List window to see the Merge button or scroll the window to the right using the scroll bar at the bottom of the window.